Entertaining tours and a relaxing sightseeing cruise celebrate Auckland?s tropical flora and marine heritage. From Savage Memorial?s panoramic views, travel to Auckland Domain?s Wintergardens to see vibrant blooms, ferns, and lily-ponds. At Kelly Tarlton?s Sea Life Aquarium, see replica Antarctic hut, sharks and stingrays and penguins? icy habitat. Experience voyaging history at the Maritime Museum before yachting in the Viaduct Basin and inner harbor ? you may even try your hand at steering! • Auckland Domain: See neoclassical Auckland Museum and manicured lawns, formal courtyards, lush gardens, award-winning ferns and lily-pond houses. • Kelly Tarlton?s: See Captain Robert Scott?s Antarctic Hut, ride moving walkway through shark and stingray tunnel, visit penguins from Antarctica. • Maritime experience: Learn and experience New Zealand?s voyaging traditions through museum exhibits and hands-on yacht cruise. • Guests must be able to walk approximately 0.75 mile. • Guests will walk over even surfaces and inclines. • Guests will ascend/descend some steps. • Time permitting guests will have approximately 15 minutes for shopping. • Order of itinerary may vary to avoid congestion. • Continue sightseeing en route to your hotel or cruise terminal. • The tour will return to your hotel or cruise terminal. 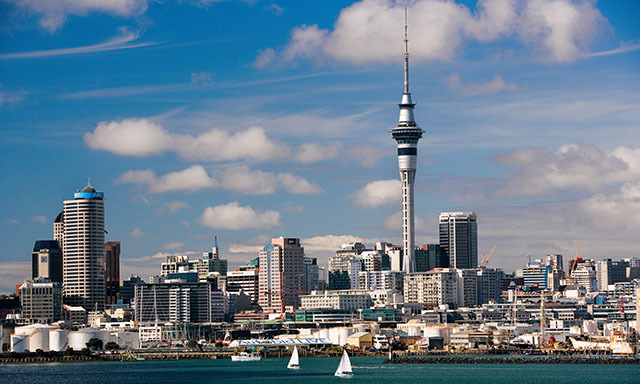 • Tour is only for guests staying in Central Auckland City hotels.